You can open and view a read-only version of your Lexbe Account Case Calendars from Microsoft Outlook using the ICS file format. The shared calendars are ‘read-only’. Calendar events need to be added, edited and deleted within the Lexbe eDiscovery Platform application. Also, alerts and repeat calendar items are not supported. Before you set up synchronization of the Lexbe eDiscovery Platform Calendar with other programs, you have to create the events to be integrated within Lexbe eDiscovery Platform. Open the 'Case Calendar' tab, create a new event by selecting 'Create New Event' button and enter the specific items in the text boxes provided and then click on the 'update' link to save. 2. Open Outlook and click on 'File>Account Settings'. This function allows Outlook to integrate the calendar from Lexbe eDiscovery Platform. 3. From Account Settings section switch to 'Internet Calendar', paste the URL address and click on 'ADD'. 4. Set up a subscription to Lexbe eDiscovery Platform Calendar and click 'OK'. 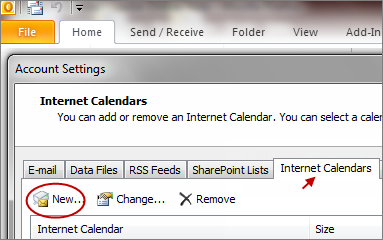 After setting up the Internet Calendar, you should be able to see Lexbe Calendar integrated into your Microsoft Outlook. Keep in mind that any changes must be made in Lexbe eDiscovery Platform Calendar, since the integrated calendar is read-only. The changes you make to events in Lexbe Case Calendar will be reflected in other calendar applications (e.g., Google Calendar or Microsoft Outlook Calendar).